Last year, I had the pleasure of visiting Japan. I have to say it is one of the most beautiful countries in terms of its abundant nature , food options and the warmth of the people. That was also my first exposure to Japanese cuisine, to be more precise, vegetarian Japanese cuisine. Their broth preparations are quite delicious, especially the soy broth. 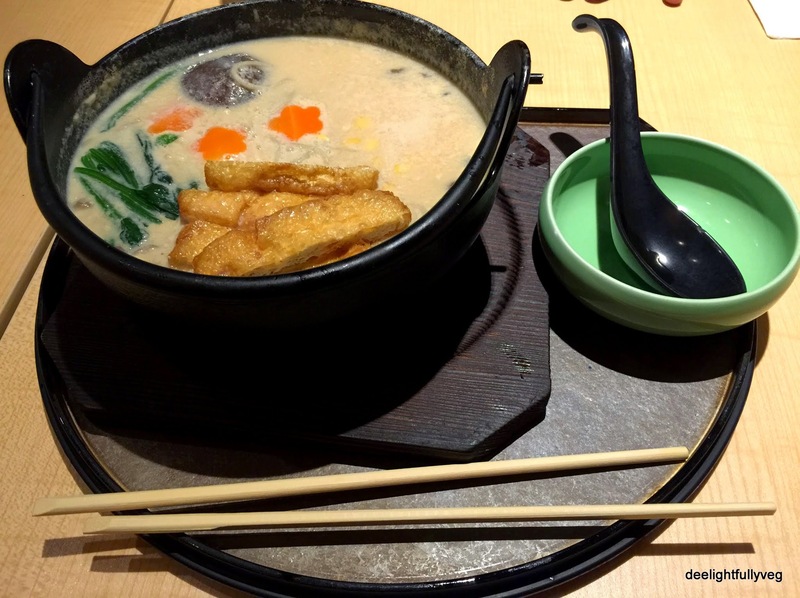 I was waiting for something of that kind to hit Singapore and I happened to chance upon the exclusive Vegetarian set menu additions of Shimbashi Soba situated at Paragon mall in Orchard. I jumped upon seeing this unique offering and I knew I had to pay them a visit. They have some special vegetarian offers for January and February 2015. Generally, Japanese culture pays a lot of emphasis on punctuality, efficiency and warm hospitality. Shimbashi Soba had all those aspects – we were seated on time, promptly served and interacted with a smiling staff who made apt suggestions on the menu. 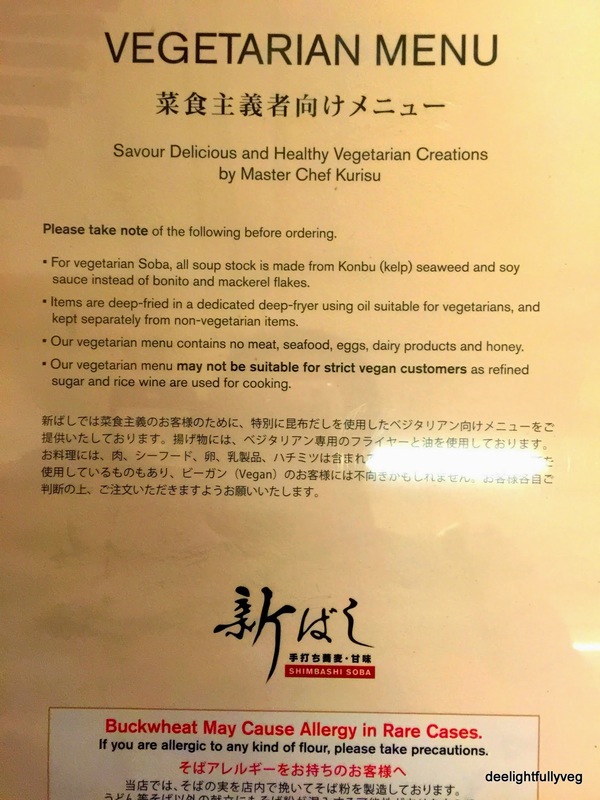 While we were waiting to be seated, I spotted a neat note explaining the difference in the vegetarian menu. This place might also be suitable for some vegans. It is always a pleasure to taste Japanese teas. I am also a huge fan of the serving vessels they use to serve different preparations. The elegant teapot was a welcome sight. 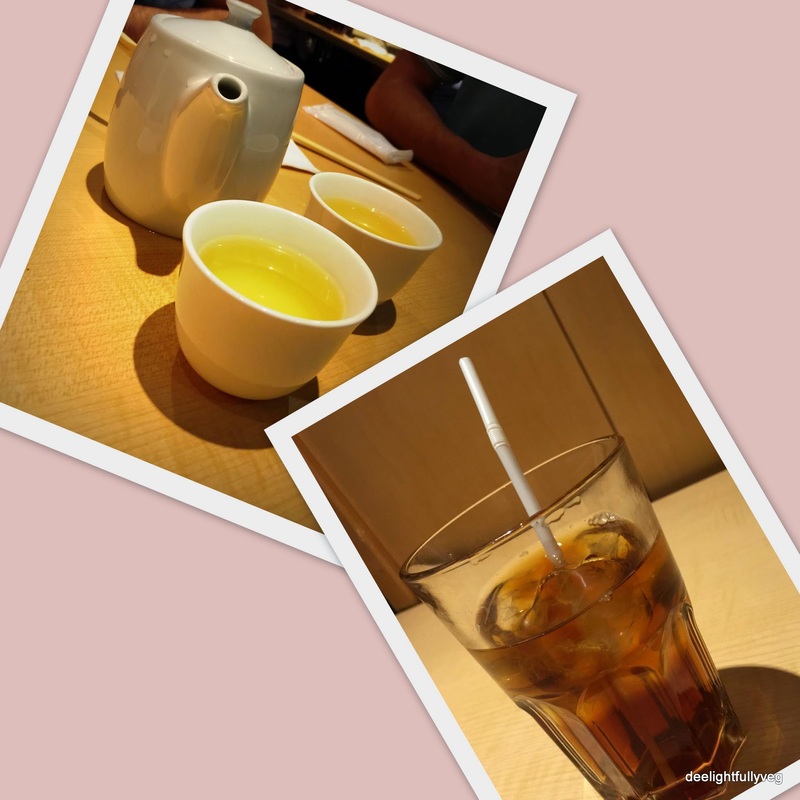 The ‘Soba Cha’ was light, mild and very refreshing. It is a no-brainer that I had to taste soba in a restaurant which had soba in its name! Their noodles are eggless. This place is popular for its buckwheat soba which is handmade in the restaurant and freshly served. The soba strips are so finely cut that it is mindblowing! Buckwheat is healthy as it is high in antioxidants. 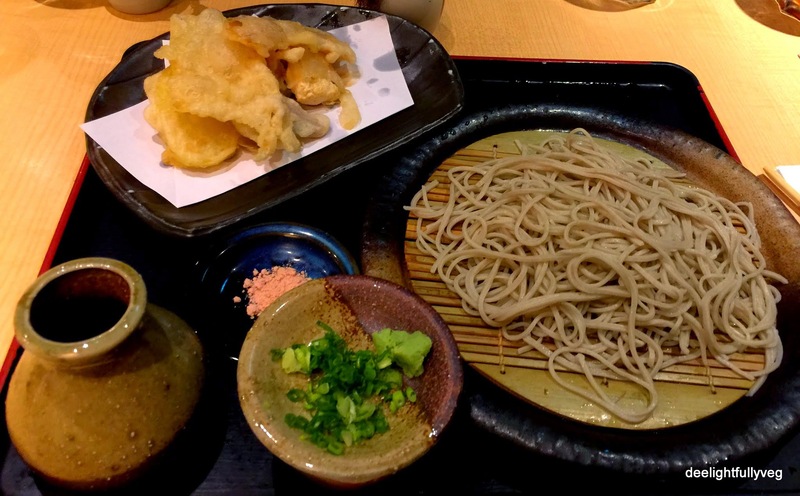 Our first order was the ‘Vegetarian Tempura Sairo / Kake Soba’ which was assorted tempura served with soba. The whole set was so pretty. You have an option to select hot soba or cold soba in the set. I was glad my friend suggested that I try cold soba. It is served on a bamboo mat with ice beneath it. I must say it was one of the nicest sobas I have ever tried. To eat it – add the garnish (served alongside) into the tea, take the noodles, dip it in the tea set and then in the plum flavoured salt. You will get all the flavours blending in your mouth with every bite. And if you want the kick, go for the wasabi! Highly recommended. Next, we wanted to try the soy broth preparation since we were also nostalgic about our Japan trip. We went for the ‘Vegetarian Tonyu Nabeyaki Soba’. I loved this dish as well. The broth is rich with hints of soy sauce coming through. The vegetables and mushrooms were well seasoned. The noodles do lose some of the texture they possess when eaten cold. This is more than made up for by the texture of the dish as a whole. For an unique dining experience, for their amazing soba noodles, for their separate menu with a variety of vegetarian offerings and for the experience of authentic Japanese cuisine, Shimbashi Soba is totally worth a visit. Domo arigato!